My Favorite Things — for Christmas! My Favorite Things — for Christmas!. 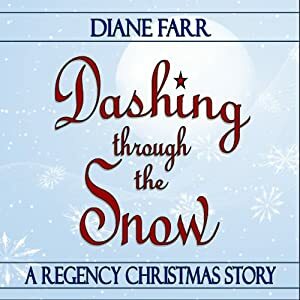 Thank you, Diana Belchase and the Waterworld Mermaids, for including my Dashing through the Snow among your favorites! This, by the way, is my first venture into audiobookworld. I chose it because it’s a novella. I figured, how hard can this be? It’s just a novella. I’ll sit down, read it into a microphone, and that’ll be that. After all, I used to be a voiceover actress in Hollywood. I still have my AFTRA card somewhere. Piece of cake, right? Well … I sort of underestimated this brave new world of DIY. When I was a voiceover talent, I showed up, read my copy, did a take or two (or three), picked up my check and went home. It was probably the easiest acting job in the world. This project didn’t work quite that way. I had to not only read the darn thing, I had to engineer it too. I had to edit out all the dead air and random noises, watch a bunch of YouTube how-to videos on audio compression and blah blah blah, and drive myself crazy applying what I learned. Okay, it was fun. But it took forever! Muse Camp is a great site, with inspiring stories, tips, interviews, and support for writers of every stripe. Anyone who has been to summer camp will understand the concept! There’s something about getting away with a group and focusing intently on something for a few days that refreshes the spirit. Okay, it’s nothing like the white elephant game. Forget it. Anyway, these are the questions … and my answers. It will be a two-word title and the last word will be “Cool.” The first book in the series is WICKED COOL. The second book is SCARY COOL. So this book, the third one, will be, um, “[something] Cool.” The “cools” I am toying with at the moment are WAY COOL, TOO COOL, and WAY PAST COOL. Oh, wait, that’s three words. But it fits better than the others. On the other hand, it’s kind of lame. What about HALF-PAST COOL? Nah, that stinks. Maybe I’ll just call the book BITE ME. Ha, ha! No, I’m not serious. For one thing, somebody’s probably already snagged that title for a vampire book. Hmm. So what is the working title of my book? Let’s go with TOO COOL. For now. Actually, I don’t have “an” idea for the book at this stage. I have a bunch of ideas, and am choosing which to use and which to toss. Then I have to comb through the ideas I’m keeping and decide which are central and which are secondary. Then I must place them in order of what happens when. Right now, I don’t know what happens in the book. I can’t hazard even a guess as to what the book is about. Frankly, I have no business answering any questions about this book yet and I can’t believe I agreed to do this blog hop. Finally, an easy question! Thank you. Young adult paranormal romance. I shall urge the director to cast whichever actors do the best job at the auditions. “A young man obsessed with death falls for an old woman obsessed with life.” Oh, sorry, that’s Harold & Maude. Crap. Guess I don’t have a synopsis yet. Will your book be published, self-published or represented by an agency? I haven’t written a single word of it yet. But so far? Two months. And I only wish I were kidding. It reminds me a lot of WICKED COOL and SCARY COOL. The reviewers of SCARY COOL. So far, every reviewer has given it five stars. And every last one of ‘em seems to expect a “next book in the series.” It’s hard to withstand that sort of pressure, folks. If I knew the answer to that, believe me, I would tell you. You and everyone else in the English-speaking world. Now for the good part: the tag for next week’s edition of “The Next Big Thing!” I proudly refer you to Kate Rothwell, who also writes as Summer Devon. Her blog is here, and it’s great fun to read. So are some of her books. I can’t say ALL of her books, because I haven’t read them all — yet. She’s awfully prolific. And by “awfully” I mean I am in awe of her. So “awfully” in the nicest possible sense of the word. It’s definitely different to be an “indie” author. When I finish a book I must choose what to work on next. Choose! What a concept. Perhaps that doesn’t sound momentous to most people, but trust me, it’s momentous. There is no one in New York telling me that I must deliver, say, a 75,000-word romance set in Regency England by such-and-such a date. It’s liberating, naturally, but it’s also unsettling to find myself drifting, directionless — and having to make decisions that will affect the next couple of years of my life without the input of a team of interested experts. Like most authors, I have a number of books knocking around in my brain, clamoring to be written. There’s Book 3 of my unfinished “star” trilogy, for example. Also a sweeping historical saga with lots of “sturm & drang” that my agent had me put together years ago— back in the days when we were trying to move me into, well, sweeping historical sagas with lots of sturm & drang. There’s a Christmas Regency that could be lots of fun, featuring two characters I love so much that I want to spread them out over four books and let everybody around them fall in love and marry off, one after the other, until FINALLY Gavin and Felicity get their happy ending in book 4. There’s at least one novella, which I’m drawn to as possibly easier to finish quickly and get out there. And then there’s the third book in my YA paranormal series, The Spellspinners. To my (mild) surprise, I find that a lot of my considerations are the same ones that a publisher would have. For example: Which, of all the possible books I could write, is the one most likely to find an audience? The difficulty with putting this consideration at the top of the list, of course, is that the question is unanswerable. Nobody knows what will sell. And the fact that publishers pretend to know, when in fact their guesses are wrong more often than they are right, has driven authors nuts for decades. So it’s ironic, to say the least, that I find this particular question pressing on me so—now that my fate is in my own hands! I would love to write a Regency again. What’s stopping me? That darn YA series I foolishly started. Because it’s contemporary. Since the Regencies are set in the past (duh), they can be written any time. A book set in the here & now must be written in the here & now. Otherwise you end up with a Sue Grafton problem. She’s the brilliant author of those Kinsey Millhone “alphabet” mysteries, which started out contemporary but have gradually slid into the past … since Sue can’t write as quickly as Kinsey’s adventures happen. Now she’s stuck writing mysteries set in the 1980’s, and it’s not the 1980’s anymore, and it’s more and more difficult to remember exactly how life really was in the 1980’s (what was playing on the radio that year? Did everybody have a microwave oven or not? etc.). Sue Grafton’s writing historicals now, and I don’t think she intended that when she started out. Fortunately, these Spellspinner books are a lot of fun to write.